Jeff Zablow and his dog, Petra, photographed by Jenny Jean Photography. What a year 2016! We sought butterflies all the way back to March. Sitting here tonight, coursing through Facebook, Kim’s, Virginia’s, Stanley’s, Phil’s, Cathy’s, Marcie’s, Barbara Ann’s, Angela’s, Joan’s,Vicki’s, Nancy’s, Erica’s, Terry’s, Joanne’s, Lisa’s, Jennifer’s, Peggy’s, Leslie’s . . . all of your beautiful butterfly posts this year got me to a melancholy place. Petra and I hit the road aboard the trusty ’06 Toyota Tundra, on the hunt for newer, better butterfly images, and time and time again, images of butterflies I’d never seen before! Petra and I traveled to: Chapman State Park (NY), Oxford (MD), Frewsburg (NY), and we made 3 trips to Eatonton (GA). My Black Russian travels very well, in fact loves to travel. She made history this year, the only pooch in the history of Interstate 20 (Georgia to South Carolina) who enjoyed a meal served to her in her bowl, on the median line on the eastbound lanes (well, due to that 2.5 hours parked delay, the result of a very scary looking 18-wheeler wreck). We now have more than 140 new images to share over the coming months. Good news that. Petra does have difficulty understanding why we aren’t on the road now, and why we won’t spin those wheels until, well, March 2017. Anyone know how to get her to get that? The red was lipstick red, and you could see it from 100 feet away. My 7 Cardinal flower plants were grouped together, inside the iron fence, just 8 feet from the sidewalk. In full sun from morning to sundown, they should have been a bit miffed, but I watered them in daily, and these moisture loving perennials showed their appreciation, by growing to more than 6 feet in height. They produced dozens and dozens and dozens of those fantastic blooms, as if in appreciation for my thoughtfulness. 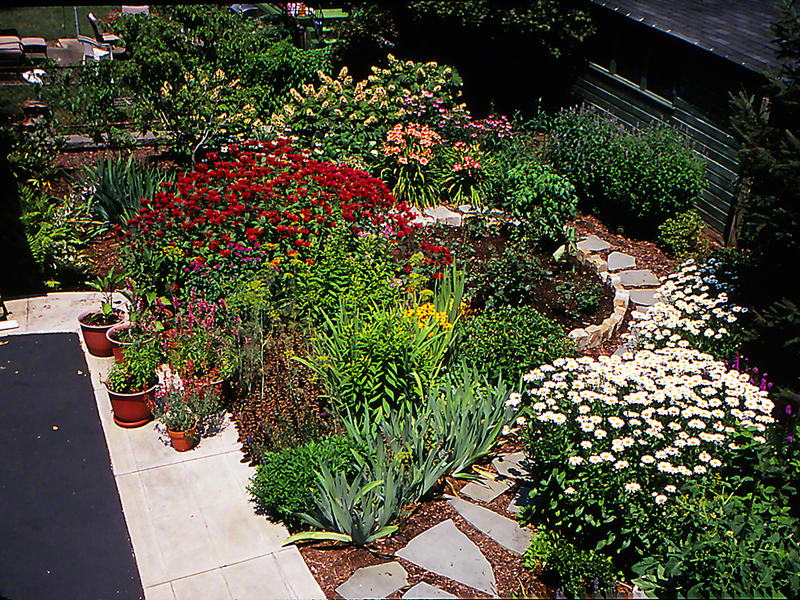 Blooming for many weeks, they put our front perennial garden on the map. Map? Whose map? The internal map of the Ruby Throated hummingbirds in the East End of Pittsburgh, Pennsylvania. They zoomed in every hour on the hour, straight to these red nectar pumps. (the flowers, that is) Methodically, bloom to bloom, leaving when someone come walking past, on the other side of the fence. They return moments later. 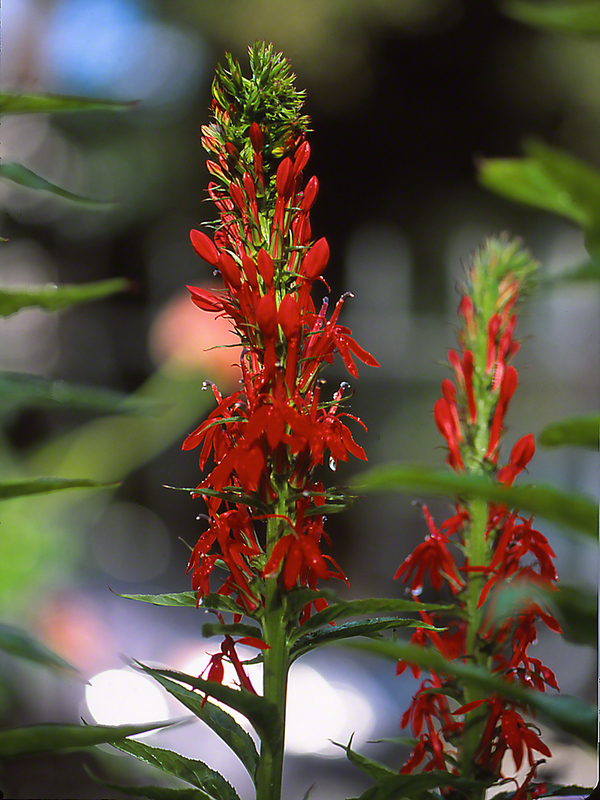 Our menu presented the hummingbirds with variety: False dragonhead, Salvias, Crocosmia, giant Zinnias and others for the pleasure of sipping nectar. I did not attempt to photograph the ruby throateds, content as I am with the photographic output of Virgina, Chuck, Marcie and others. Spring will return and bring in the third season for my cardinal flowers. Where and how did I acquire them? From a fantastic native plant nursery, right here in Pittsburgh, just ½ mile from my Beechwood Boulevard home! Sylvan Natives, where I found my American plum trees, Pagoda dogwoods, American hornbeams, Chokecherries, Tulip tree, Sennas and couple of others. Save for the deer and woodchucks, I’d be able to report 100% success . . .
Oh, and nary a single butterfly seen at the Cardinal flower.